The Old Cobram-Barooga Bridge, consisting of a two-span de Burgh truss bridge with a central single, vertical-lift opening span supported on cast iron piers located on the former road that connects the border towns of Cobram (Victoria) and Barooga (New South Wales). Since the beginnings of European settlement, the waters of the Murray River have been a key factor in the commercial agricultural development of what has been some of the most productive land in modern Australia. During the mid-nineteenth century toll-ferries and row boats had a monopoly on transporting people and goods across the river. From 1889 a punt operated between Cobram and Barooga and was the only means of crossing the river at this point. 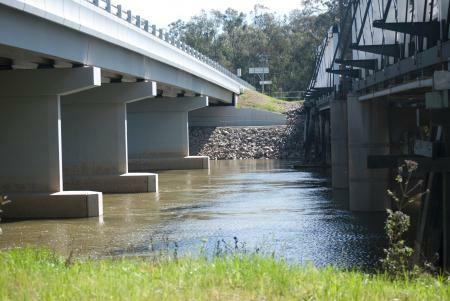 In 1879 two bridges opened - the Murray Bridge (South Australia) and the Echuca-Moama Bridge. During the 1880s and 90s the colonial governments of New South Wales and Victoria began a joint program of building bridges with opening spans which could accommodate paddle steamers, trains and road traffic. The Old Cobram-Barooga Bridge was officially opened on 3 December 1902 and provided access for heavy goods vehicles to transport agricultural produce. The central lift-span of the bridge allowed paddle steamers to pass underneath. The bridge was constructed by the prolific Victorian bridge-building firm of JB and W Farquharson of Melbourne. The improved capacity to transport agricultural goods, particularly wool and wheat, to Melbourne, Sydney and larger regional towns consolidated the importance of north-eastern Victoria and the Riverina District of New South Wales. The Cobram Bridge is the only bridge on the Murray River whose construction was completely funded by the Victorian government. In 2002 a high level concrete bridge was built to the south of the original 1902 bridge, which remains open for pedestrian traffic. 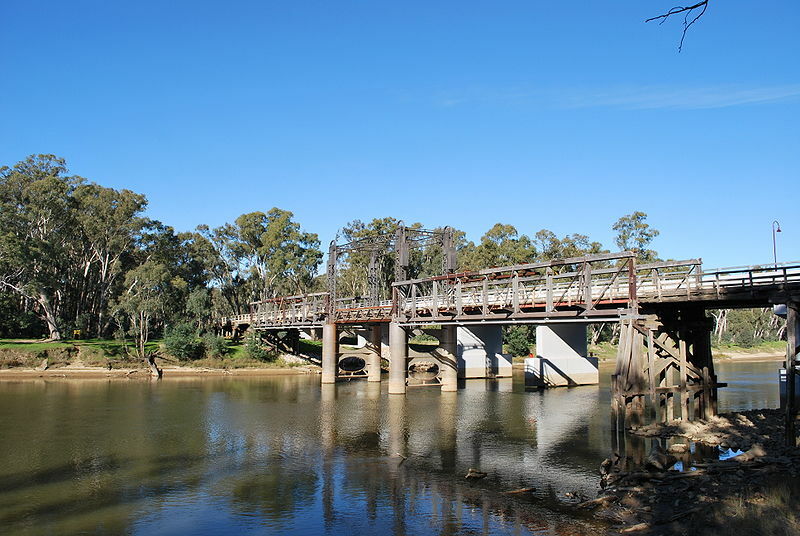 The Old Cobram-Barooga Bridge is a timber truss, lift-span bridge carrying two traffic lanes across the Murray River between Cobram and Barooga. The primary axis of the bridge is east-west. The bridge has a clearance over normal water level of 7.9m with the lift-span closed and 14.3m with the lift-span open. The bridge was superseded by a parallel concrete bridge and no longer carries vehicular traffic. The three main spans include a single, vertical-lift opening span supported on cast iron piers in the centre of the bridge, flanked by a single de Burgh Truss span on each side. The eastern (NSW) side has been truncated and retains only one timber beam approach span, which terminates in a steel fence and stair to ground level. All three timber beam approach spans survive on the western (Victorian) side. The outer ends of the truss spans and the approach spans are carried on timber trestles on timber piles. The outer ends of the lift-span are carried on twin cylindrical cast iron piers with intermediate perforated steel plate braces. The lift-span is formed by a roadway between riveted Pratt-Truss box-girders with a span of 18m. The road deck on the lift-span is narrower than the approaches and reduces to one traffic lane. The lifting superstructure comprises four steel lattice towers, connected at their upper level by steel lattice girders. The two de Burgh truss spans, each 31.7m, are of composite timber and steel construction, with paired timber top chords and vertical struts with steel rods forming diagonals within each panel. The approach spans range from approximately 9.1m to 11m in length and are of timber beam construction, comprising five parallel timber logs spanning between timber and trestle piers. Each span has been strengthened by the addition of four steel rolled steel joists (RSJs), one each located in between the timber logs. There is a footway on the southern side with a timber guardrail but the majority of the timber decking of the footway has been removed. The footway is absent on the lifting span and the footways have an entrance to the road deck on either side of the opening span (pedestrians are/were required to share the road deck with vehicles for the length of the opening span). This site is part of the traditional land of the Yorta Yorta people. The bridge is of significance to the people of northern Victoria and the Riverina region of New South Wales as it improved road, rail and river links between the states which encouraged the agricultural and economic development of these regions. All of the place shown hatched in Diagram 2352 encompassing part of Crown Allotment 7D Parish of Cobram. Since the beginnings of European settlement the waters of the Murray River have been a key factor in the commercial agricultural development of what has been some of the most productive land in modern Australia. From the 1830s onwards crossing the river became a necessity and this involved the construction of infrastructure such as wharves, weirs, locks, bridges, including pontoon and truss bridges. By the mid-nineteenth century toll-ferries and row boats had a monopoly on transporting people and goods across the river. 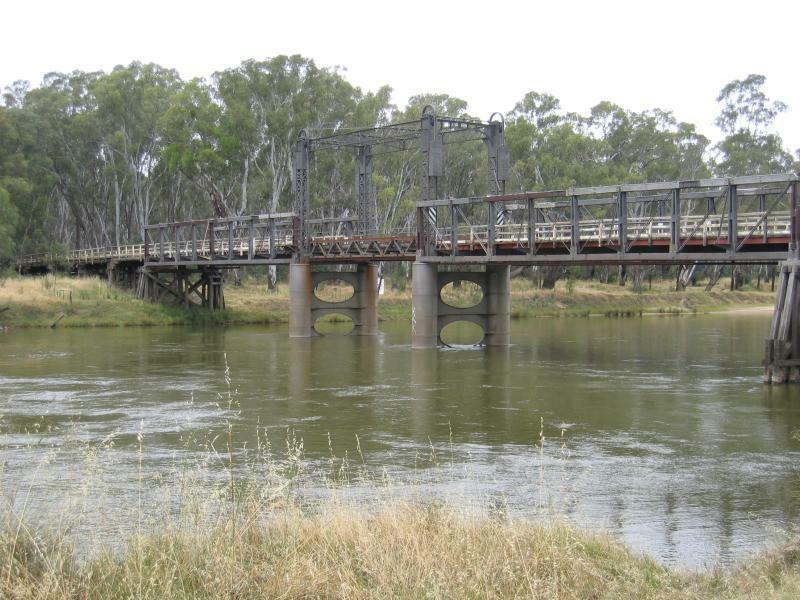 In 1879 two bridges opened - the Murray Bridge and the Echuca-Moama Bridge. From 1889 a punt operated between Cobram in (Victoria) and Barooga (New South Wales) and was the only means of crossing the river at this point. By the 1890s the limited capacity of ferries became a hindrance to the steadily increasing road traffic. In response the Colonial Governments of New South Wales and Victoria began a joint program of building bridges for land-based transport and that would accommodate paddle steamers. High-level bridges were the ideal, but the combination of expensive river spans and long approach viaducts graded to suit horse and bullock drays made this option too costly. The affordable alternative was low-level bridges with moveable spans. This solution had already been anticipated when in 1858 Henry Hopwood established a pontoon bridge at Echuca. During the 1880s and 90s the Colonial Governments of New South Wales and Victoria began a joint program of building bridges with opening spans which could accommodate paddle steamers, trains and road traffic. The bridge building program coincided with discussions about the use of Murray River water for agricultural irrigation between the colonies. During the 1870s closer settlement programs highlighted the need for a regular water supply and in 1887 George Chaffey commenced designing a massive irrigation scheme at Mildura. In 1893, representatives of the three states met in Melbourne and considered the installation of locks on the Murray River to preserve supplies for irrigation and facilitate river transport. Economic conflicts of interests between the colonies stymied coordinated action. 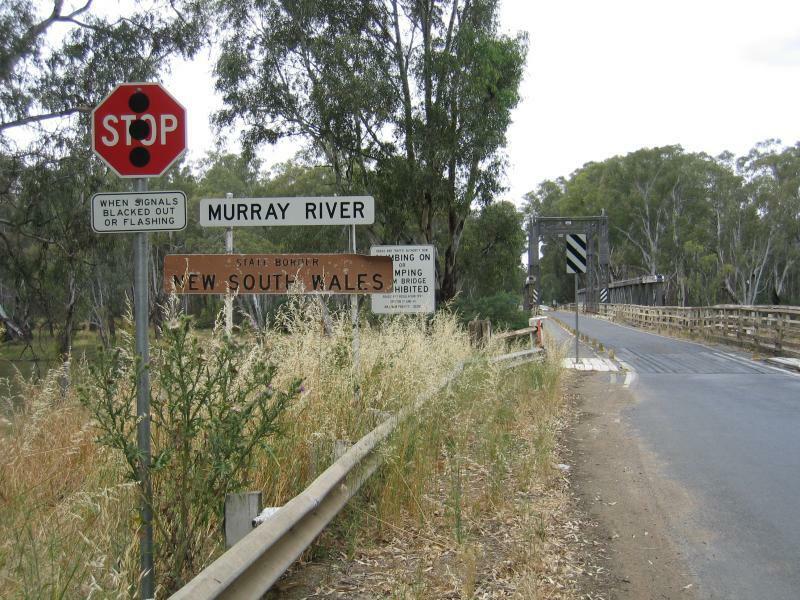 Federation in 1901 meant that the three states in which the Murray flowed were no longer in competition. In 1902 a Royal Commission recommended joint control of the Murray River by the three states and a joint funding arrangement for water conservation infrastructure, such as dams and weirs. As irrigation systems grew there continued to be a need for bridges over the Murray River between Victoria and New South Wales. The prospect of a bridge in the Cobram-Barooga district had been discussed regularly at public meetings since 1884. By November 1899, Government Ministers in both states reported that decisions had been taken to proceed with the bridge and that specifications were being prepared. After Federation was given royal assent on 9 July 1900 the declaration of tenders for the Bridge were awarded in November 1900. It was decided that the bridge would be financed and built by the Victorian government. The bridge was constructed by the prolific Victorian bridge-building firm of JB and W Farquharson of Melbourne. The Bridge opened officially on 3 December 1902, two months after being open to traffic. It provided access for heavy goods vehicles and the central lift-span allowed paddle steamers to pass underneath. The improved capacity to transport agricultural goods, particularly wool and wheat, to Melbourne, Sydney and larger regional towns consolidated the importance of north-eastern Victoria and the Riverina District of New South Wales. The Cobram Bridge is the only bridge on the Murray River whose construction was completely funded by the Victorian government. It appears that the Victorian Country Roads Board was also responsible for its maintenance after opening. The construction of the bridge is evidence of the value of the wool industry in the vicinity and of the economic flows of goods between NSW and Victoria. In 2002 a high level concrete bridge was built to the south of the original 1902 bridge, which remains open for pedestrian traffic. In Australia, stone (and brick) arch bridges provided the major form of bridge until the middle of the nineteenth century, after which, local engineers turned to timber truss bridges to provide the majority of river crossings, with the (expensive) imported wrought iron bridges reserved for railways and the larger and more heavily trafficked roads. Although timber beam bridges are limited by the dimensions of available materials, timber offered the cheapest and quickest bridge solution. In NSW, the availability of excellent hardwoods provided Public Works engineers McDonald, Allan, Dare and de Burgh with a uniquely strong and durable material for timber truss bridges. Timber beam bridges served well for 150 years as relatively inexpensive structures to aid the movement of goods and people. 1860-1886 Public Works Department Truss (PWD).A basic truss bridge, based upon English models, in use from 1860 to 1886. It took advantage of the local hardwoods for its main members and was a solid and durable design. 1886 to 1893 McDonald Truss. Built from 1886 to 1893, the McDonald truss improved upon the Old PWD type by addressing several of its particular shortcomings. These included the placement of cast-iron shoes at the junctions between timber beams, the end members were doubled and splayed for better lateral stability and wrought-iron rods were utilised for vertical tension members. 1893 to 1929 Allan Truss.Built from 1893 to 1929, the Allan type also used cast iron connection pieces and vertical iron rods but was a significant improvement on the McDonald type, with most main members doubled and spaced, a simplified tensioning system and using smaller individual pieces of timber. 1899 to 1905 de Burgh Truss.The de Burgh Truss was built from 1899 to 1905. This truss was a composite truss, utilising timber and steel in combination. It was distinguished by the use of pin-joints in the connections between the steel bottom chords and the steel diagonal rods. The de Burgh Truss was an adaptation of the American Pratt Truss design developed by Americans Thomas and Caleb Pratt in 1844. Prevalent from the 1840s through the early twentieth century, the Pratt truss inspired a large number of variations and modified subtypes during the nineteenth and early twentieth centuries. 1905 to 1936Dare Truss.The Dare Truss is very similar to an Allan truss but used steel bottom chords. Designed by Harvey Dare and built from 1905 to 1936, the Dare Truss incorporates the best features of both the Allan Truss and the de Burgh Truss, whilst eliminating the pin-joints of the latter that proved problematic in maintenance. The Dare Truss was the most successful of the timber/steel composite trusses. The Old Cobram-Barooga Bridge was designed by Ernest de Burgh and uses de Burgh Trusses. The de Burgh Truss is unique amongst the five timber truss types, as it was the first to depart from the previous standard type. A defining feature of the Old Cobram-Baroonga Bridge its arrangement, with timber vertical posts, timber top-chords and steel rods as inclined tension members, bottom chords formed by continuous parallel steel plates, steel plates and diagonal rods connected to the bottom chords by turned pins. The Cobram-Barooga Bridge also has a movable lift-span bridge whereby a horizontal span, counterweighted between two towers, could be raised vertically to provide a passageway for the steamers and their towed barges. Opening-span bridges were built from 1890 until 1941, after which no new opening bridges were erected on the Murray River. Ernest Macartney de Burgh (1863-1929) was one of Australia's foremost engineers of the late colonial period and the early 20th century. He was born in Dublin, Ireland and received his engineering education at the Royal College of Science. At age 22 he arrived in Melbourne then onto Sydney where he joined the New South Wales Department of Public Works on 30 April 1885. He was to specialise in the design and construction of bridges, water supply schemes and dams. In 1901 de Burgh was appointed Engineer for Bridges in NSW and by that time had been associated with many major bridges. This included the 50 metre single truss bridge over the Lane Cove River which was at the time the longest timber truss span ever built in Australia. He also developed the composite timber and steel truss that now bears his name, and was a member of the Sydney Harbour Bridge Advisory Board. Ernest Macartney de Burgh was regarded as one of the ablest civil engineers in Australia whose achievements had been recognised internationally. NSW State Heritage Register Nomination Form, Department of Planning/Heritage Council, NSW, September 2015. Don Fraser, 'Cobram-Barooga Bridge over the River Murray', in Newsletter of Engineering Australia, no.15, August 2004. Permit exemptions as outlined in Standard Exemptions for Works Requiring Heritage Council Approval, Heritage Branch, New South Wales Department of Planning as approved the New South Wales Minister of Planning, 25 March 2009. 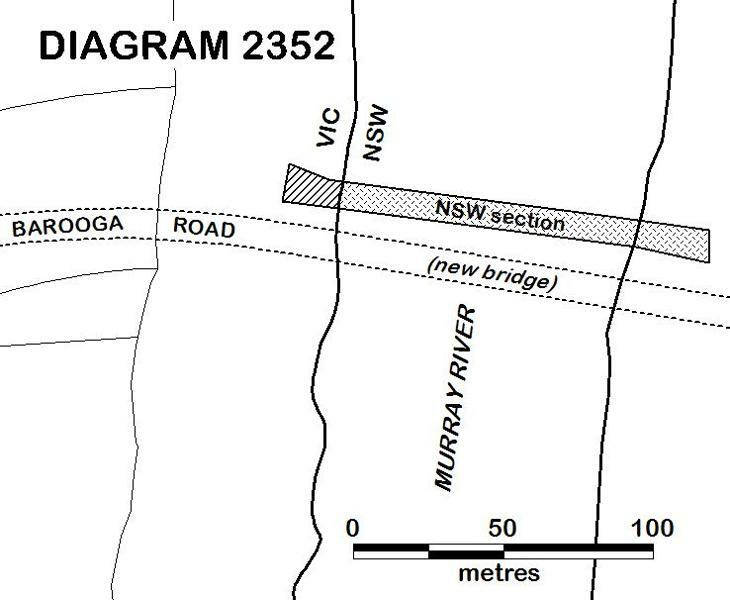 The extent of registration of The Old Cobram-Barooga Bridge in the Victorian Heritage Register affects the whole place shown on Diagram 2352 including the land, all buildings, roads, trees, landscape elements and other features. Under the Heritage Act 1995 a person must not remove or demolish, damage or despoil, develop or alter or excavate, relocate or disturb the position of any part of a registered place or object without approval. It is acknowledged, however, that alterations and other works may be required to keep places and objects in good repair and adapt them for use into the future. The cultural heritage significance of the Old Cobram-Barooga Bridge lies in its historical significance as one of most important Murray River bridges constructed between New South Wales and Victoria. Built in the Federation era, it was an impressive capital works project which formed part of a broader network of road, river and rail routes and facilitated economic and regional growth in both states. The Old Cobram-Barooga Bridge is a rare de Burgh timber truss bridge with a metal Pratt lift-span. It is one of three surviving vertical lift-span bridges of this type and is one of two that retain all of their lift-span operating mechanisms intact. The Bridge is of technical significance because it represents the peak in the evolution of lift-span technology in bridge engineering in Australia.